Why Would I Backup Thunderbird? Whether you have disk space considerations, are planning to move to a different email client or simply wish to retain a backup of your messages to date, it is an easy task to create a backup of data in Mozilla Thunderbird. This can then be imported into another email application or simply stored away for posterity, perhaps on an external disk drive or optical disc. However, Mozilla Thunderbird comes with no backup or exporting utility built in. This means that you will need to find a suitable plugin to make this possible. While not the most efficient backup process, once you have found and settled on the best solution for you the actual act of backing up your data is streamlined so that you are able to get the job done and get back to reading messages rather than backing them up. Let’s take a look at some methods of making a backup in Thunderbird, and the steps required. Whether or not you would need or want to back up your emails in Thunderbird will depend on your email account type. If you have a POP account, then if anything happens to your computer or hard disk drive, the emails will be lost forever. However, if you have an IMAP account, email messages are often stored simultaneously on the email server. This makes it easy for you to set up and sync your email account with different devices, such as a PC, laptop, mobile, etc. If you want to set up IMAP, you should speak to your ISP or mail administrator for information on how to do this. If you use Google Mail, however, our guide to configuring IMAP should prove useful. Of course, Thunderbird also features contacts, as well as various general settings and server certificates, so there is plenty more to back up if you decide to go down the path of a full backup tool. Rather than spend time downloading and installing a backup tool for Thunderbird, you might opt instead for a manual backup. This isn't for the faint-hearted, however, as it requires browsing through your computer's file system to find the Thunderbird data. On Windows 7, you will find this data in C:\Users\[username]\AppData\Roaming\Thunderbird\Profiles – however before browsing to this location, open Windows Explorer and open Organize > Folder and search options > View > Show hidden files, folders and drives. This will allow you to open the Profiles folder, and it is here that you will need to right-click the listed profile, select Copy and then Paste your copy (essentially a backup) to a disk drive or location of your choosing. If you were specifically looking for a Thunderbird backup utility, you might not be surprised to find that these are few and far between. However one tool that seems to perform the job admirably is MozBackup, available from mozbackup.jasnapaka.com/download. Sadly only available for Windows (all versions from Windows 98 through to 7), MozBackup will create backups of emails, address books, passwords and certificates as well as general settings for Thunderbird, and can also be used to backup your Mozilla Firefox data as well. This app is very easy to use. After downloading and installing, exit Thunderbird and launch MozBackup. You can then select to bacup or restore (useful for disaster recovery) and then select the Thunderbird version you are using, before clicking Next. In the following screen select the profile you want to backup and Browse… to change the default backup directory before clicking Next again. You will then be asked if you want to set a password to protect the backup file. After this, you can then select the data types (emails, address books, etc.) that you wish to backup and then click Next to create the backup. 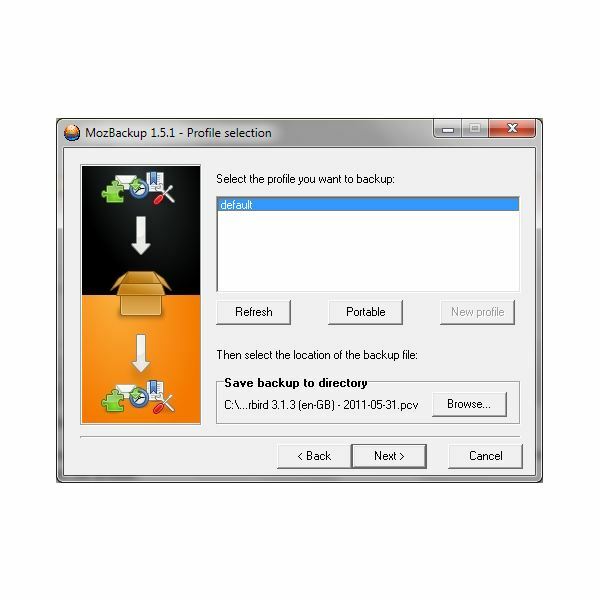 Once complete, a summary will appear listing the contents of the backup, and you can exit MozBackup by clicking Finish.